Fiction – paperback; Bloomsbury Publishing; 256 pages; 2006. 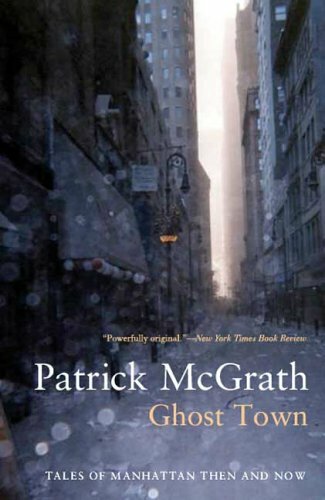 I have long wanted to read something by British-born New York-based writer Patrick McGrath if only because his subject matter, often dark and Gothic, intrigues me. I bought this one on a week-long trip to Manhattan last October when I prowled the city’s book stores looking for novels set in New York. This one practically leapt off the shelf at me, so I bought it, but not without reservation: I’m not a huge fan of the short story. I needn’t have worried. The three stories in this collection could best be described as novellas (63 pages, 112 pages and 68 pages apiece) and each was incredibly gripping in its own distinctive, haunting way. Each first-person narrative is set in Manhattan, but at different time periods, beginning with the American Revolution and ending in the days following 9/11. The Year of the Gibbet is told through the eyes of a man dying of cholera in 1832 looking back on his childhood. “It is fifty-five years since my mama died, and I have no doubt but that I will follow her before the week is out,” he tells us on page 2. Here, on his death bed, he comes to terms with the guilt he feels for his mother’s death, for it was his suspicious behaviour as a boy that lead to her capture by the British Army. She was later hanged for being a traitor. The second story, Julius, is also told by a narrator looking back on past events. In this case, a woman tells the tale of her grandfather, a painter, whose eye was gauged out by a student of his who lost his mind and was put in an asylum for 20 years. The student came from a very wealthy family. When he fell in love with an artist’s model — an Irish woman from the wrong side of the tracks — his father cruelly stepped in to prevent the union. The final story, Ground Zero, revolves around a psychiatrist treating a male patient, Dan Silver, who has problems sustaining intimate relationships with women. In the aftermath of the terrorist attacks on the World Trade Centre, Dan tells his shrink that he has fallen in love with a Chinese prostitute, Kim Lee, who has problems of her own. Kim lost her lover in one of the towers but believes she still sees his ghost walking the streets. All over New York buildings were going up, others coming down, some no more than ten years old, but in this impatient town where nothing ever has a chance to decay, ten years was practically an eternity. […] For him the din and chaos of a city engaged in an unending turmoil of construction was nothing more than a spectacle provided for his amusement. It was theatre, and this being a period when increasing numbers of Europeans were arriving in Manhattan every day, the streets became more diverse, more colourful and exotic with every ship that discharged its cargo of humanity at the Battery. There are common themes throughout the stories, namely death and ghosts and the terrible things people do to one another at times of extreme duress. The city, too, is a malevolent presence, where only the toughest inhabitants survive. Indeed, the opening line from a story set in the late 18th century — “I have been in the town, a disquieting experience, for New York has become a place not so much of death as of the terror of death” — could almost be its closing sentence describing the days after 9/11, too. All in all, a thoroughly superb trio of elegantly spooky stories, and a great taster for McGrath’s work. There are many secrets in Manhattan. He seemed to have captured them well. McGrath is possibly my favourite living novelist – his novels Asylum, Dr Haggard’s Disease and Port Mungo are essential and perfect examples of storytelling prowess mixed with literary-ventriloquist brilliance. I am eagerly awaiting a proof of his new book Trauma, due out later this year. John, does your love of McGrath explain the name of your blog? Actually it’s a happy coincidence! I really meant Asylum as meaning ‘a place of refuge’ (for me, mainly) but after I’d named it I realised it tied in well with my McGrathomania. I like the sounds of this one. Not an author I’ve come across before, but definitely a book I’ll be adding to my ever-growing to-read list!